The statistical survey reveals the usage of real estate website is amplified among the user from decades to decades. In the year 2008, around 36 million people uniquely visits a real estate websites. Here you can get readymade real-estate website to start business with a minute which includes enriched features like property management, and CMS control etc. 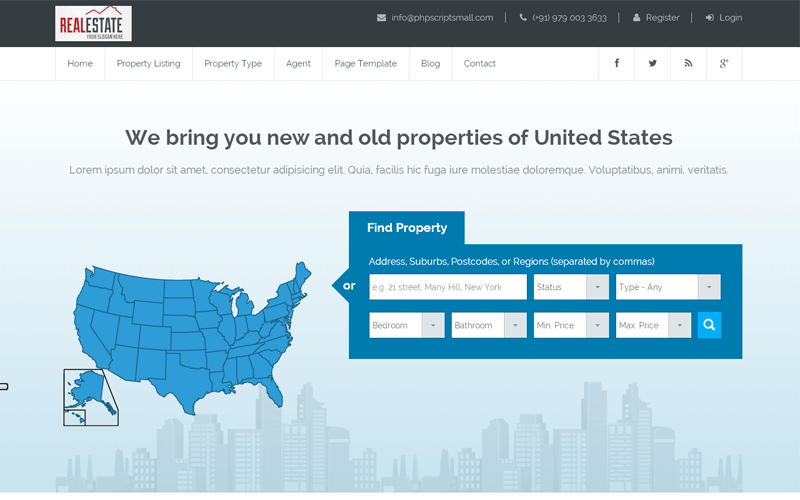 If you were looking forward to start agency portal then you are in the right place to buy a scalable realestate website script. A visitor turns into the customer through our entrepreneur realestate script since our realtor script makes a door knocking leads. Once the user registered into the site, one can each property contains their details like additional features of the property, price, and property agents contact details, assets in Google map view, etc. Through custom search user can filter the result like desired property type, bedroom and lavatory with price filtration and send contact request to the agents. With preferred membership plan user can post the property in the dashboard of PHP Real Estate Script. User can manage their profile, membership package, properties, and blog section etc. Our Open Source Real Estate Agency Script is well versed to handle the request from the various cases. An influential admin panel is dedicated to control the entire website over user friendly structure. Admin could add the property and properties added by the users are approved by admin. Realestate agents and partners requested are managed under one place. Membership packages are managed by powerful payment gateway called PayPal, all transactions are undergone over and done with a secure transactions. Admin privileges are managing comments from the user, media profile, category and sub category, and general settings like CMS pages alike Site address, E-mail address, time zone, date and time format, site language, payment gateway and more. Hence we at php scripts mall also provides customized end to end solution for budding entrepreneurs through swot analysis by researching strength, weakness, opportunity, and threats. By analyzing these criteria you can start the glorious realtor business in the market. In website design and development customer satisfaction plays vital role, in order to ensure our clients we proudly grant one year of technical support and six month source code update upon purchasing our real estate scripts. Our renowned trust makes clients are across the globe. I just want to say I really enjoyed working with this PHP Scripts Mall team. I must say I was really impressed. Thank you!!!! I must say that I am very impressed by your script. I had experiences with other WordPress e-commerce developers. Once purchased their scripts, the support was very awful and it was extraordinary features. I think you will be doing very well!!! !